I've been posting all year about our forest pasture experiment over on our Avian Aqua Miser blog. For those of you haven't been following along over there, the idea is to create a permaculture system that feeds our chickens with very little input of storebought food. Our first season of experimentation was very much a learning experience --- now I know that even heirloom broiler breeds have been bred to bulk up quickly on grain, so they look at foraging about the same way a modern teenager looks at the idea of getting rid of his TV and Wii. I'm changing my focus now to a forest pasture system that will keep our laying hens happy and healthy, with the goal of revisiting persnickety meat birds in the future. With the broilers in the freezer, our forest pasture experiment started making progress. In late August, I realized that our two pastured chickens were so happy on their diet of kitchen scraps and wild edibles that they didn't want any storebought grain. For six weeks now, I've only given them a cup of feed every couple of weeks, on days when I felt like our kitchen scraps weren't quite up to snuff. Meanwhile, I seeded the fallow paddock with buckwheat and shelling beans, which are now mature. With our coop remodelled to accommodate laying hens, we turned our four prime layers into the fallow paddock, expecting them to gorge on the high quality seeds. Instead, they focused their energy on nightshade berries, tender young chickweed leaves, calcium-rich snails, and bugs found by scratching through the old compost pile. In fact, now that I could look at our tractored chickens and pastured chickens side by side, I was shocked to realize that the former were not the epitome of avian health I'd thought they were. The pastured chickens have brilliantly red combs --- a sign of good health --- while our confined birds' skin is a much paler shade. Keep in mind that our tractored birds have as much grass as they can eat, along with occassional bugs that hop through their tractor, but that they get the majority of their nutrition from the corn and soybeans in their laying pellets. Clearly, a grain-based diet is no better for them than it is for me. With the garden's exuberance winding down, I'm sure I'll have to continue feeding our laying hens grain through the winter, but my long term goal is to come up with a system that deletes the grain entirely. Two more paddocks are on the horizon, which will allow us to rotate our flock frequently enough to give them plenty of forage during the growing season. Our Illinois Ever-bearing Mulberry and Nanking Cherries should be reaching full productivity in a few years, which will go a long way toward feeding the flock during the summer months. Buying less and less processed food in the grocery store will also mean more and more food byproducts to give the chickens year round --- for example, our oil expeller will produce high protein seed cakes perfect for chicken feed. We'll continue to work on insect farming as a supplemental food option, and will keep you updated as our forest pasture experiment progresses. A homemade chicken waterer is a great addition to the forest pasture, resulting in an even healthier flock. So how does the egg production vary with the new digs? Also now that you hens are pastured, who does the garden bed rehab that the hens used to do for you, you know the tearing up of leaves and the addition of high power fertilizer. Those are good questions. Unfortunately, I don't have any real data on laying yet --- the one hen we've had in there is a broody hen who doesn't lay much anyway. On the other hand, we just discovered that she had started laying under a bush before we put the laying boxes into the coop --- she'd been laying an egg a day! I figured I'd play it safe and feed the eggs back to the chickens since I didn't know how old they were, but I didn't want to give whole eggs to our flock and promote egg eating. So I threw them at a stump, and one egg was so hard it bounced! Clearly, she was finding plenty of calcium along with protein. We don't really use our tractors very efficiently in the garden, which is why I think that concentrating their fertilizer into the coop is actually best for us. We drag them across the grassy areas around the garden, then throw the grass clippings on the beds, but the beds themselves are too high to drag a chicken tractor onto easily. I've used the tractors now and then to break up new garden ground, but that's pretty minimal --- we can always throw a few hens in a tractor if we need to do that. This puts you one step closer to free ranging. 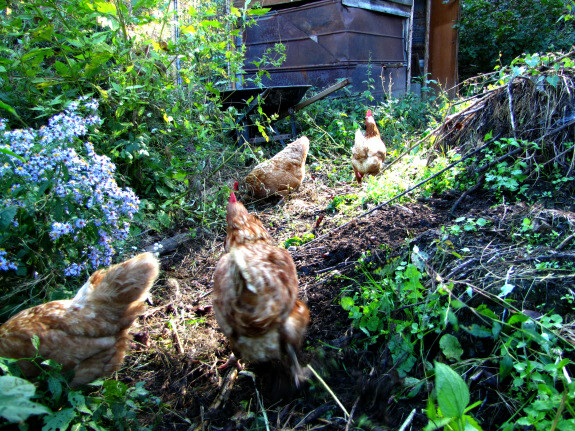 After they get acquainted with their new coop and the garden stops producing, maybe you can let them roam during the day? We started rotating our lawn grass clippings through our coop and small attached run (used during spring planting) before going to the garden. Old clippings come out of the coop for mulch for gardens and new clippings go in to have weed seeds removed and nutrients added. Works great and helps keep things clean. Side note: If you remember the urban chicken tractor I made to my brothers high standards, he now uses it only as a coop and lets the chickens roam his back yard. His neighbors started sitting on their patio in the mornings just to watch his chickens. A lot of people seem to enjoy true free range, but it doesn't work well with our garden. I like to mulch individual beds, and the chickens have a hay day spreading all of my carefully tended mulch into the aisles. I also have a four season garden --- there is always something alive and growing --- so there's no real fallow season when the chickens wouldn't bother my crops. If I concentrated all of my winter crops and perennials in a certain part of the garden, I could probably fence the chickens into the other half of the garden rather than using cover crops, but cover crops give me a lot more organic matter than chicken poop does, and right now I'm working on building my soil's organic matter rather than just the fertility. I plan to do something very much like your coop rotation --- put leaves, straw, weeds, etc., in the coop, and then rotate them out to be mulch in the garden once they've been well fertilized. I also plan to plant wheat in one of the paddocks after the chickens eat up the buckwheat, which will give me not only grain for the chickens, but also (I hope) straw for the garden. I definitely don't have it figured out yet, but I'm having fun playing with it! It sounds like you (and your neighbors ) are too. Ya I have a constant issue with the chickens digging through the mulch and also wonder about the impact they may have on the positive bug population. My wife is not at all happy with the manicured flower beds around the house being de-mulched by the girls. Everyday I have to rake up the hardwood mulch and put it back around the flowers, so I can see your point. I've come to the conclusion that chickens and mulch just don't mix, unless you're putting down a heavy kill mulch and don't care too much about what happens to it in the short run. You are a better person than me to rake the mulch back every day --- I might be tempted to eat those chickens! 7 Hens, 1 forest, 7 eggs a day. It's good to hear other folks who are trying to find more economical and sustainable ways of raising chickens. I got into raising raising laying hens last october. I live on 18 acres of forest, and had a two story shed already on my lot. I converted the shed into a coop with some laying boxes, and hay and my hens were ready to go. I figured there was more than enough food in the forest to feed all my birds and let them roam. I live in MI so the winter I had to feed them grains. But now that the spring kicked in, my birds are more than content living off the abundance of the forest. I have a swamp area, and a large pond where they go to get all sorts of large bugs and frogs. The forest bed is also polluted with worms, so they have an unlimited supply of good proteins. They all are happy, healthy and laying pretty much every day. When I purchased these birds they were already about 2 years old, but they are still laying strong. Jonathan --- That's a great story! I think the trick with asking your chickens to live entirely off the fat of the land is keeping the flock small and giving them lots of space. In the summer, we raise a lot of broilers, so we don't get as much benefit from the pasture, but we were very pleased with the low feed costs this past winter when we ran our laying hens in the woods!